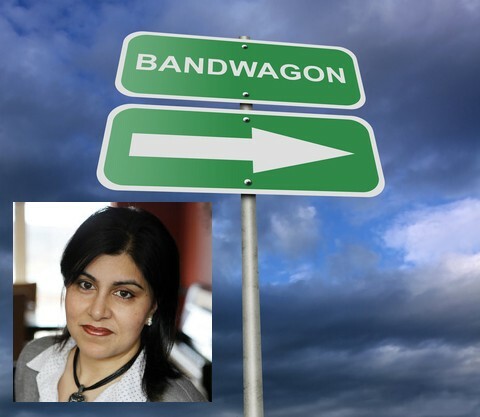 The British Gazette » Baroness Warsi: Jumping on the bandwagon. But from where? This news comes as somewhat of a surprise to your Editor and others in the Leave campaign. This is because nobody knew that the Baroness had joined us in the first place! Presumably the Baroness will be able to cite a precedent buried somewhere in the tomes of the EU’s Corpus Juris allowing for ex post facto applications/resignations as part of the charter of fundamental rights! What this announcement does show is just how the world has changed since 1:48PM on Thursday 16th June 2016 and the assassination of Mrs Cox in Birstall. The Baroness is of course not alone. Many Conservatives not only in the Leave campaign are attempting to “make their peace” with the Chameleon and his associates. Now that the good ship Brexit is sinking fast those seeking the continuation of their careers in the Tory party are undergoing the humiliation of the kow tow. The Baroness is of course fully aware that following his success at the polls the Chameleon will take his revenge on his erstwhile colleagues. Heads are going to roll and a cabinet “reshuffle” – which will extend far beyond the cabinet – will be a purge of all those Tories who dared support the Leave cause. This of course will leave many posts to be filled! One of which the Baroness hopes will be filed by her! 1. She is an Asian. 2. She is a Muslim. 3. She is a Woman. 2. A ministerial aide – aka the hand-bag carrier. 3. A ministerial car. Just the thing for those shopping trips (sorry – retail therapy sessions) to Knightsbridge! The question the Editor has to ask himself and his readers is this: “How do we describe the Baroness?” We and our colleagues have checked our records and can find no evidence of her ever joining any of the Leave/Brexit campaigns. So what do we call her? Attaching a label to many politicians is not a problem. For instance, Comrade Corbyn will proudly sport the label “Socialist”. Caroline Lucas will proudly sport the label “Environmentalist”. The late Lord Brockway would proudly have sported the label “Pacifist”. Ms Nicola Sturgeon will proudly sport the label “Scottish nationalist”. The only label we can think fits Baroness Warsi is that of “Opportunist”.